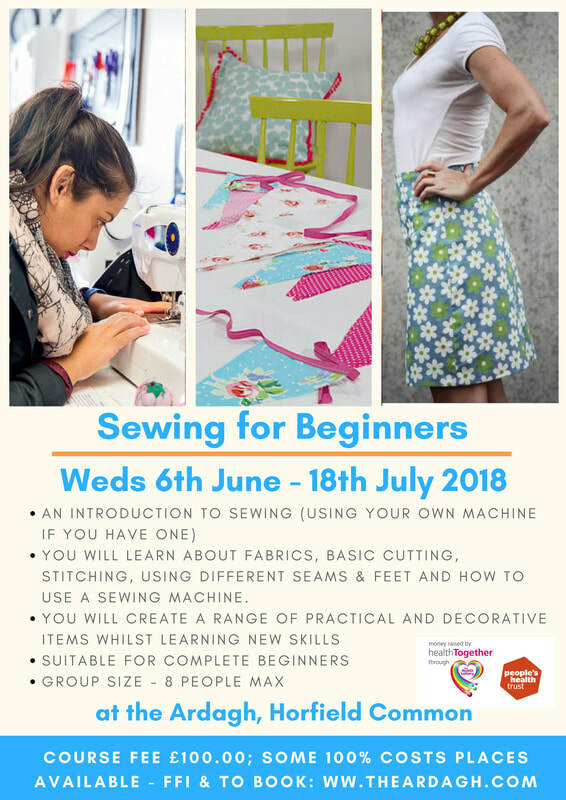 Join tutor, Ali Bingham for this fantastic 7-week introduction to sewing course. YOU WILL LEARN ABOUT FABRICS BASIC CUTTING, STITCHING, USING DIFFERENT SEAMS & FEET AND HOW TO USE A SEWING MACHINE. To book a place, please use our contact form. We will send full details of how to pay when we confirm your place is reserved. If there is demand, we will be running 2 sessions per day - one in the morning & one in the evening. Please advise when you book which session you would like to attend (Session 1: 10.00am - 1.00pm or Session 2: 6.00pm - 9.00pm). Places for both sessions are limited to a maximum of 8 to ensure plenty of time for individual attention and support. There are a small number of bursaried places which cover 100% of the costs of the course. These are funded by People's Health Trust for residents in Manor Farm as part of the Ardagh Repair Cafe Project. If you would like to apply for a funded place, please advise when you get in touch & we will ask for some additional details to confirm eligibility.